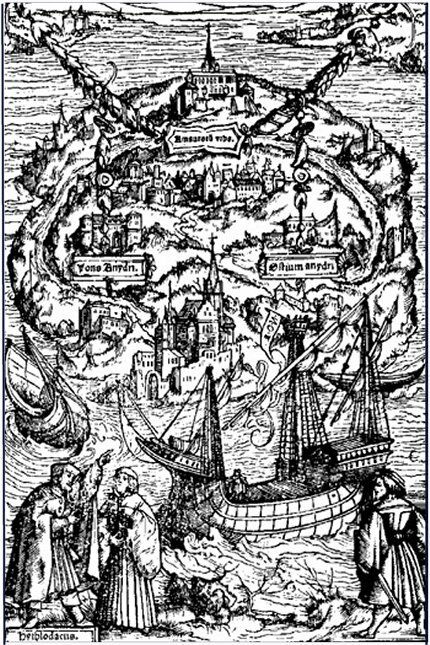 I just finished reading Thomas More’s short work of fiction, ‘Utopia’. ~100 pages that took me three days of bus travel and a beer on a patio to read. Though it is hailed as being a comedic sucess of sarcasm and wit, I found it to be more inspiring in its description of this place called Utopia. Don’t get me wrong, I laughed a good amount too. There is one part [SPOILER, of said joke] which made me laugh particularly loud. The story teller explains that the Utopians (who are essentially communists without an internal system of money) value gold so little that they chain their slaves (who are criminals, saints, and foreigner volunteers) with it, and on the heads of the salves are placed ornate crowns of precious shiny metals and stones. Shortly thereafter he tells a story of European diplomats meeting the Utopians dressed as slaves (the Europeans covered with gold and jewels in an effort to impress) which both amuse and confuse the Utopians. ‘Why would foreigners send their slaves to open diplomatic ties?’ the Utopians must have thought. Hah! A friend described it as his go-to for getting someone interested in philosophy. Here’s the book itself, free online. I’m sure you can find it just about in any format if you google precisely enough. Or, you could visit your local library or used book salesperson, and grab a physical copy (as I prefer). Check it out, great read.